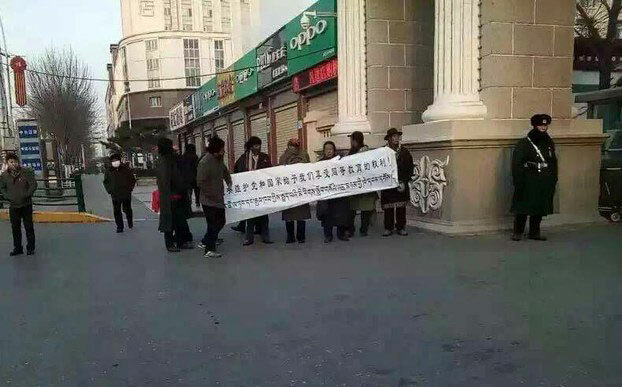 (TibetanReview.net, Jan30’16) – Tibetan and Muslim students of a school in Qinghai Province, joined by their parents, have on Jan 24 staged a joint protest, alleging ethnic discrimination in teaching programme and misappropriation of fund by local education authorities, reported Radio Free Asia (Washington) Jan 28. The protest took place outside government offices in the provincial capital Xining, with the participants calling especially for investigation into the activities of the education department head of Bayan Khar (Chinese: Hualong) Hui Autonomous County of Tsoshar (Haidong) prefecture. The protesters were reported to be demanding the right to equal education opportunities as promised by the Communist Party and government of China. The protesters belonged to the county’s Gangjong School, which was founded in 2005 with help from local businesses to teach Tibetan and Muslim students in Tibetan, Chinese, and English languages. China’s central government later agreed to provide additional support and facilities. However, the county education department withheld and misappropriated the promised funds while also “belittling the teaching of Tibetan in the school,” the report cited local sources as saying. School authorities were reported to have visited Xining many times to appeal, but without success. This led to the school’s parents and students staging a sit-in protest, urging an investigation by higher-ups in the government.